The wedding season is just around the corner, and as usual, popular designers are busy adding final touches to their bespoke outfits for brides-to be. While some go traditional, others chose to experiment. If you are among those who wishes to be a modern bride on her big day, especially at a white wedding, look no further. 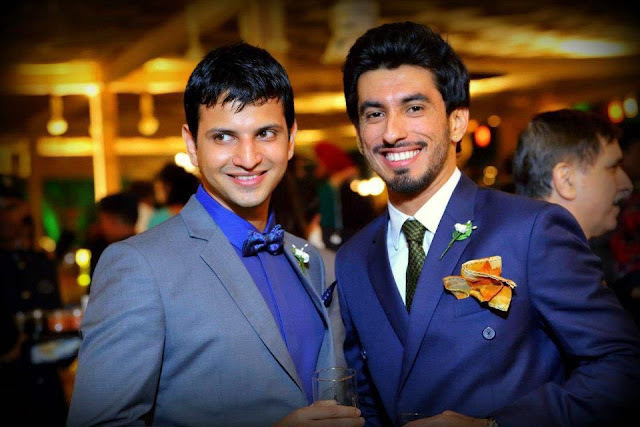 label Karleo's Karan Berry and Leon Vaz, who are known for their pret-a-couture and couture garments. One look at their stunning evening gowns and bridal ensembles, and you can't help but get mesmerised by the fine detailing. 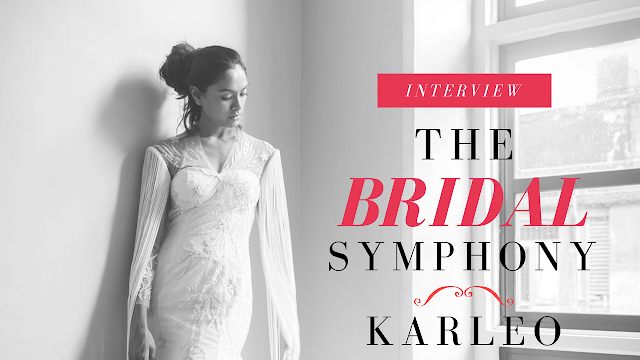 Last month, we got an exclusive glimpse of their latest collection - White Symphony, that reflects the harmony between faiths and is perfectly designed for the modern bride. 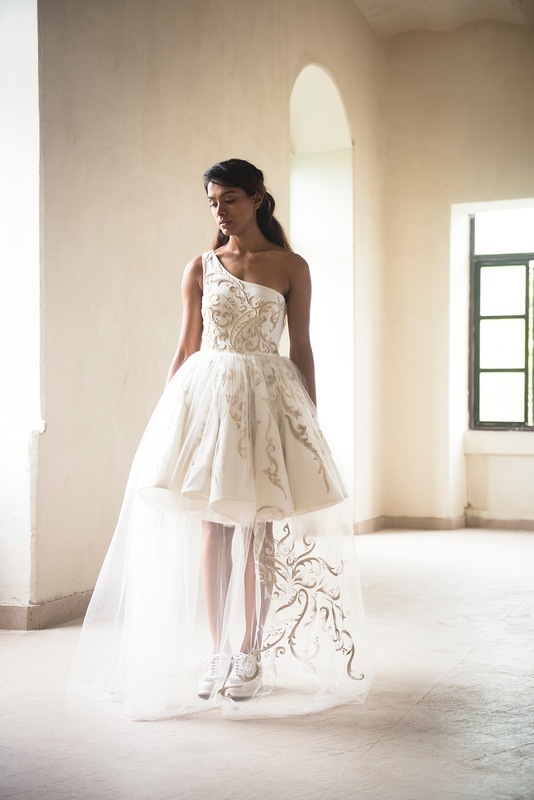 In an exclusive chat with Diary of a Dancebee, we got the designer duo to tell us more about their latest collection, vision and some helpful tips for the brides-to be. As designers, is there a particular vision that you have for your label, Karleo? As designers we make sure we offer our clients exactly what they want as a bride. Our aim is to make the brides dream come through with her wedding gown. We ensure high quality of craftsmanship along with accessories and styling tips for the bride. It’s a one stop shop for every bride. What was your inspiration for the new ‘White Symphony’ collection? White Symphony is for the modern bride. It reflects harmony between faiths, and the growing norm of interfaith wedded bliss. In this bridal collection, stark, pristine white makes way for other hues, with accents of crimson, emerald, vermillion and black representing different faiths. Celebrating bespoke bridal creations, the collection includes bird motifs as symbols of customised elements in bridal wear that truly mirrors a bride’s personality. Do you personally believe the collection also breaks stereotypes attached to white weddings and the outfits traditionally worn by brides? The idea is to provide the bride with designs that complement her along with being comfortable. Brides want to experiment these days and are willing to opt for different styles and even use color for a white wedding. How did you conceptualise this collection? Our design ethic has always worked on contrasting factors. We love to combine the odds with evens. White Symphony is a derivative from our clients and people we end up meeting. It reflects a combination of different cultures, and blending it well to create a piece. Over the past year, we have had a lot of inter faith weddings, which was the inspiration behind the creation of white symphony. Do you think the audience is more open to experimenting with their bridal outfits, compared to, say five years back? Yes! The audience is willing to experiment with their gowns. Every bride wants her outfit to tell a story, which is weaved in through different memories of their existence. What has been the most bizarre or hilarious demand that a client has ever made? We had a bride once make an entire black bridal gown, since the color black was a symbol of safety and security for her. Any tips for brides this season / Any particular Dos and Don’ts that you share with your clients, especially brides, very often. Incorrect shoes is a major faux pas. Wearing a wedge platform shoe with an evening gown is a complete no-no. It changes the way you walk and completely spoil the look. It’s not important to wear high heels with a gown but, heels do help you to walk gracefully. It maybe a small thing but it makes a huge difference. Personally, we feel shoes are the most important thing. You have to know what kind will go well with your outfit. It can break or make the look. Also, accessories should always be used in the right proportion. What are your predictions for the next season, SS 17 and for Summer brides? Trends are tilting more towards the simplest classic styles and colours. The old school charm is back in its true sense without it being altered. The trends will come from our childhood memories of fashion, which we saw growing up. Long Sleeves are definitely here to stay. Pinafore dress is coming back. Classic evening wear with more focus to detailing (stitching, beading etc) is also making a come back.